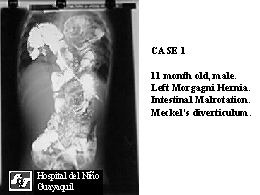 An 11 month old male patient, born in a small town 60 km. from Guayaquil. Came to de ER with mild respiratory distress, cough, fever. Symptoms onset 48 hours before arrival. Similar episodes several times since birth. On physical exam no asymmetric thorax, respiratory sounds audible on both sides. Abdomen showed lightly scaphoid. A Thorax Standard X ray showed air trapping images in both hemithorax. No mediastinum displacement, and the gastric fundus in abdomen below the left diaphragm. 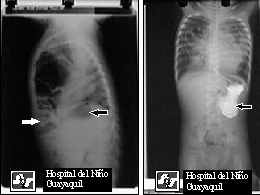 On the lateral view, the anomalous image was localized behind sternum, and clearly passing from abdomen to the thorax. A contrast G-I exam showed the Stomach in place, and part of the small and large bowel in the anterior mediastinum, in a big cavity growing into both hemithorax. Entrance was seen to the left of the Sternum. 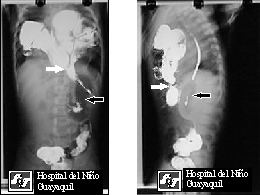 In the OR 24 hours later, a huge Morgagni Hernia was found in the left side. It was sutured, overlapping technique, no drains. Good recovery.